Lesser flamingos have a deep red bill, tipped with black, whereas the bill of greater flamingos is light pink, tipped with black. 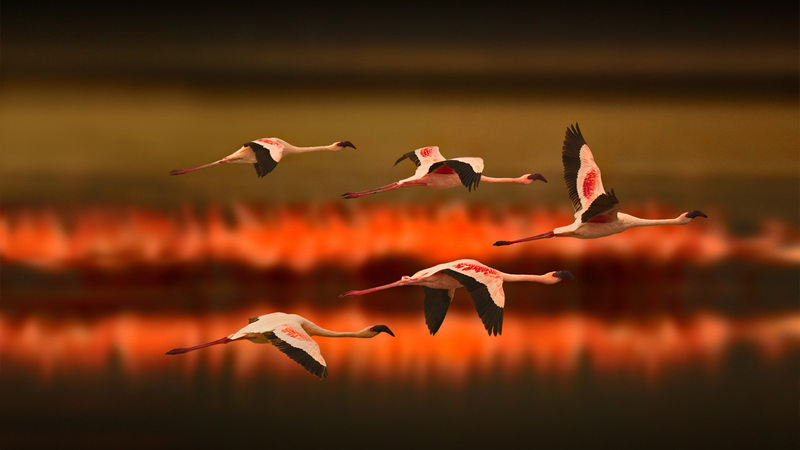 Of the six species of flamingos around the world, the lesser flamingo is probably the most numerous. That’s despite the fact that the vast majority of lesser flamingos breed on a single lake here in Tanzania, called Lake Natron. This shallow lake has such high levels of alkaline that it would burn human skin. But some remarkable microbes called cyanobacteria just love the conditions of the lake. These cyanobacteria photosynthesize just like plants do, which changes their color from blue-green to shades of deep red and orange. The lesser flamingos then eat the crimson cyanobacteria, which turns their feathers a dashing pink with red highlights.